What a wonderful State you have! We just got back 4 weeks ago from a three day trip down the entire Oregon Coast for our very first time. We started in Astoria. We stayed in a B&B that overlooked the Columbia River inlet and Astoria bridge. What a charming little town. The Silver Salmon restaurante was an excellent choice for the freshest sea food and chowder we have EVER had. We went to the Astoria Tower in hopes of climbing to the top for spectacular photos but the stairs were being re-done and are due to open in about a week from now. Next visit we will climb the tower! The Maritime Museum is fabulous! One could spend an entire day in it. We traveled down the coast to Tillamook for the second night but not before stopping at Cannon & Seaside beaches. Haystack rock is all I imagined. Along the way we stopped at Cape Meres Light House. What a georgeous view from the reflector room. And tour guides were very helpful and informative. A tour of Tillamook Cheese factory is a must stop for all. How neat it was to see how the cheese we all love is being produced into separate packages. I am a Major supporter of that cheese factory! We then took highway 1 on the three capes scenic road along the coast line. What a drive that is! We spent the next night in Newport where we visited the Aquarium. The next morning we drove back North to Depoe Bay to ride the whale watching boats. The winds were strong and the waves mighty so the boat had a tough time in the bay. Half the customers got sea sick and there were no whales to be seen. Oh well, next trip if the waves are not a sea state of 3 or 4 we may try that one again. From there we continued down the coast and visited every light house that was open or that we could get close to. The Yaquina Head light house is the tallest of the 9 and it was open so we climbed to the top to look out. What a view. Yaquina Bay light house was interesting as well. One can learn a lot of history from the light houses alone. We did see all 9 of the light houses and got close to most of them. The weather was rainy and the wind fierce for most of the three days down the coast but it seemed like just as we were getting close to one of our chosen attractions the clouds would part and the sun would shine on us. We often wondered if we were getting help from above! I think we were! We spent our final night in Brookings as we did not want to cross into California any sooner than we needed to. We gassed up at the Brookings Fred Meyer then did some shopping inside where we met a local man who was very friendly and helpful to us. He owns a hotel and RV park on the harbor. Our entire three days with the Oregonians was very pleasent and relaxing. Everywhere we went the people were all so helpful and cheerful. I don’t know why we took so many years to visit the Oregon Coast! 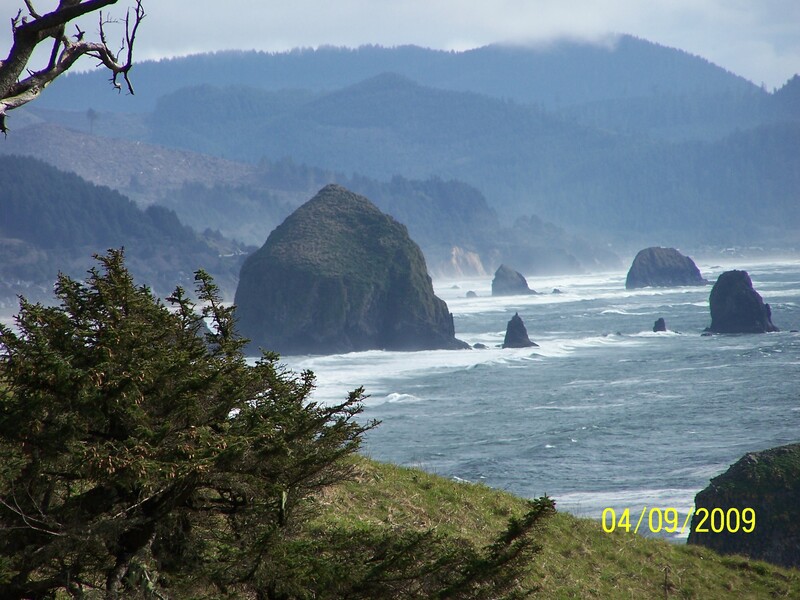 You can bet on one thing though and that would be that we will be visiting the Oregon Coast very soon again. In fact we have decided to be retiring there part or most of our time in about five years to come. Makes me want to check it out.